With a thirteen major works over a fifty-year career, one that includes a 2007 Pulitzer Prize, selection for Oprah’s Book Club, and Oscar-winning film adaptations of his novels, Cormac McCarthy is one of America’s best-selling novelists of the South and Southwest. 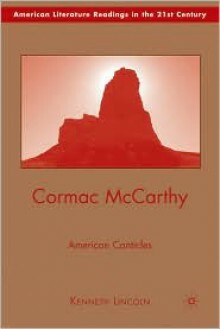 Cormac McCarthy offers a shrewd chapter-by-chapter reading, exploring concepts such as the Southern Gothic novel, the Southwest border, faith and suicide, and father-son relationships. Respected scholar Kenneth Lincoln shows how McCarthy’s canticles of praise, grief, and warning mix classic, biblical, and ballad genres and cross the lyrical with the narrative. Lincoln makes a compelling case that McCarthy is our greatest millennial novelist in a time of heroic challenge and high global stakes.